This Balance self adjusting mattress system features a closed system that envelops and redistributes pressure for optimal therapy. Each air chamber communicates and redistributes the patients pressure evenly over three distinct therapy zones. Since air supports the majority of the load the system is designed to last year past a standard alternating pressure mattress. The high resilient foam is encapsulated in preset air chambers with airflow control. The soft sloped foam cradles the heel to reduce pressure and sheering in critical zones. This balanced air mattress easily converts to a "hospital grade" by adding a pump for alternating pressure therapy. The additional alternating pressure combined with the self adjusting technology will help manage pain healing up to a stage 4 bed sore. This medical air mattress is user friendly and extremely easy to set up. A patient will experience comfort, pressure relief, advanced pressure redistribution to heal and prevent bed sores with this medical air mattress. The (12) 5.5" tri-laminated foam filled air cells are separated into three distinct pressure zones, each zone independently self-adjusting to the patient's needs. The air cells are contained within a high density foam perimeter which creates a smooth transition from the side rail to the air cell. In addition, the cavity is sloped downward in the foot section to reduce pressure in the heel zone. On top of the air cells is a layer of 1" Visco-Elastic foam as well as a layer of high density convoluted polyurethane foam. Top Cover is a multi-directional stretch nylon which reduces heat buildup and provides a low shear non-friction surface that is anti-microbal and water resistant. This Balance self adjusting mattress system features a closed system that envelops and redistributes pressure for optimal therapy. Each air chamber communicates and redistributes the patients pressure evenly over three distinct therapy zones. Since air supports the majority of the load the system is designed to last year past a standard alternating pressure mattress. The high resilient foam is encapsulated in preset air chambers with airflow control. The soft sloped foam cradles the heel to reduce pressure and sheering in critical zones. This balanced air mattress easily converts to a "hospital grade" by adding a pump for alternating pressure therapy. The additional alternating pressure combined with the self adjusting technology will help manage pain healing up to a stage 4 bed sore. 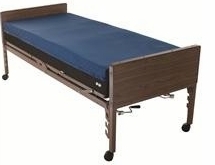 This mattress is designed for a standard medical bed frame or a twin size box spring. Pump Power When Used w/Power Source (P) 110 VAC, 60 Hz. Pump Airflow When Used w/Power Source 5 LPM. Pump Cycle Time When Used w/Power Source (P) 10 Minutes. Pump Type When Used w/Power Source (P) Compressor. Mattress Cover Material Fluid-Resistant Stretch. Weight Capacity 600 lbs. .